This plugin integrates Gravity Forms with your Authorize.net account Customer Information Manager (CIM) functionality. You can charge (or just authorize) an amount and simultaneously create a CIM profile for future use. The Profile ID is noted in each form entry in a yellow box. The plugin operates as a Gravity Forms Payment Addon so creates a settings page where you can map it to your form fields. And you can conditionally use the plugin depending upon the users choices. NOTE this creates a payment. Please use my CIM Profile Creator if you are not processing a payment. 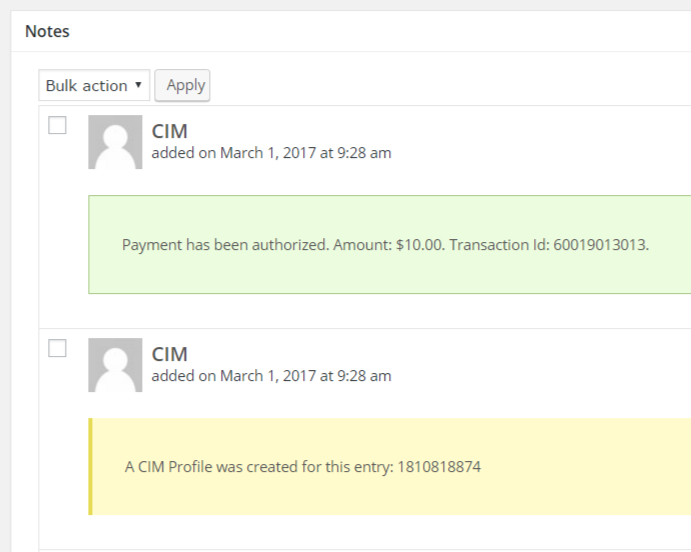 Add the ability to process a payment and create a Customer Information Manager profile (CIM Payment Profile) through Authorize.net. Upload the CIM Payment plugin and activate. Choose whether to authorize the payment amount(authorize) or charge immediately (authorize and capture). Either way, a CIM profile creation will be attempted upon a successful transaction so you may charge against that profile later. Select a condition if applicable (for example if you have a checkbox to ‘Save my card profile’ and it is checked, process the feed). This allows you to use the plugin in conjunction with other payment processors. You just control which processor kicks in by using the condition. 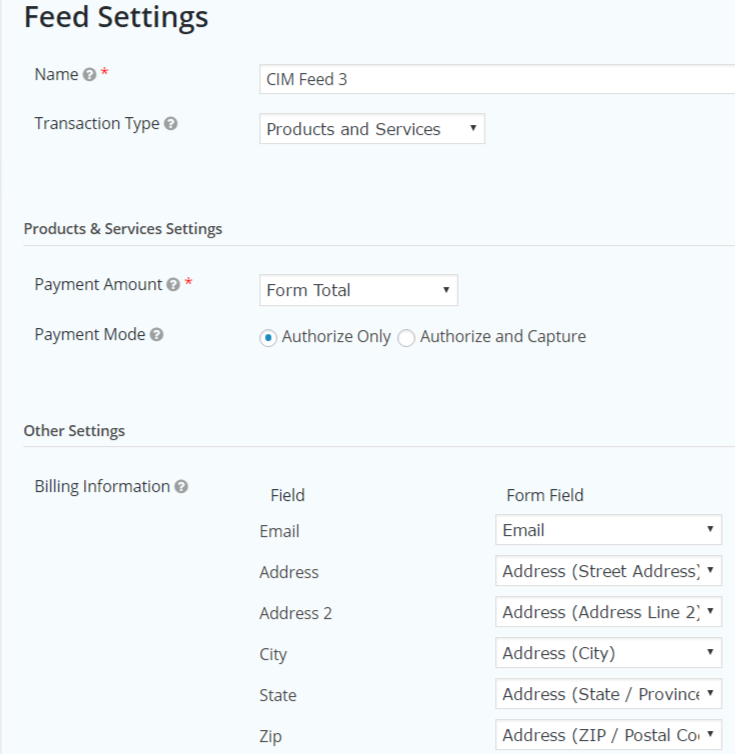 To create CIM Profile without charging a customer, do not enable a feed for a Credit Card or eCheck payment. Gravity Forms requires an amount to process a payment feed so your submission will fail if you attempt to do so. Works with Gravity Forms Products and Services type. Does not work with Subscriptions. This plugin only works with transactions greater than $0 (a Gravity Form condition). Need to just create a profile? My CIM Profile plugin just creates a profile without processing a payment.